University students rely on their mobile devices for everything – from keeping up with their classes to finding out what’s happening on campus. Five years ago, Johnson & Wales (JWU) embarked on a mobile implementation to meet the needs of its always-connected students. Ed wanted to streamline JWU’s events calendar, minimize data entry and make it easier for users to find out what was happening on campus. As part of this initiative, we wanted to allow students to view events on their mobile devices. However, our old events calendar wasn’t mobile friendly. It was very difficult for us to pull events from our main calendar and reuse them across our mobile, social and other digital channels. Johnson & Wales learned about Localist at a higher education conference and saw that other schools, such as the University of Rhode Island, were using it. JWU also wanted to customize its events calendar and access event data via Localist’s API. Localist has a robust API compared to many other solution providers, which was a big plus for our technical team. It allows us to reuse event data across our digital, mobile and social channels. The IT Digital Services Group rolled out Localist four years ago. Ed didn’t run into any major roadblocks during the implementation, but when he did have a question, Localist’s support team was right there to help. Localist’s support team really stepped up. They were very responsive and even facilitated conversations with other schools. They also gave us an implementation playbook of what has worked with their other clients. We found this information very helpful. Localist offers JWU a lot of flexibility in how it groups and displays events. JWU can now tag events by campus, department or student group. Then, the events automatically appear on relevant feeds throughout JWU’s website and mobile app. After the initial launch, the IT Digital Services Group developed training materials and rolled out Localist to more departments and student groups. “We were able to start small with Localist and then grow it organically. This was a big plus, as large projects tend to stall and take a while for people to jump on board and adapt." Localist makes it easy for us to add events and share them across all of our marketing channels. It also gives mobile users a great experience. This is critical, as over 57% of our event traffic comes from mobile devices. Localist integrates with Google Analytics, so JWU can see how its events calendar is impacting its SEO. 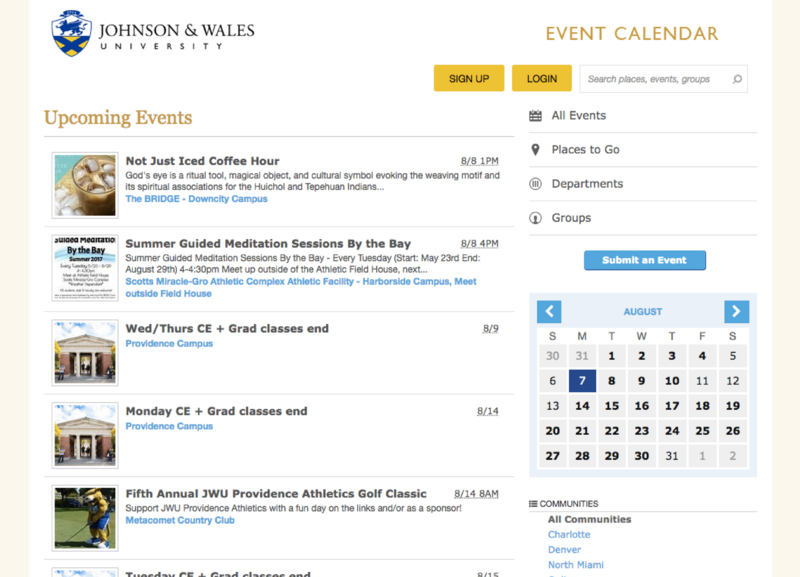 Although the old events calendar didn’t attract much organic traffic, Localist changed that by making JWU's event postings more search engine friendly. Over this past year, Localist brought JWU 163,481 new visitors and 128,292 returning visitors. In the past year alone, JWU has seen the organic traffic for its events increase by 196.13%. JWU’s event widgets and social channels are also driving more traffic to the university. Events are a critical part of JWU’s marketing plan. JWU’s day school, online school and continuing education program all run events for specific prospects. JWU’s marketing team can put campaign codes into Localist and send prospects emails with these codes. Then, Marketing can track clicks and open rates. Once a prospect gets to the Localist event listing, Marketing can see campaign conversion rates through Google Analytics. Localist also helps the JWU community engage in word-of-mouth promotion. When users share and talk about events, they become an extension of JWU’s Marketing team, expanding the reach of their programs. Localist has allowed the IT Digital Services Group to build a consistent process for posting events. JWU is currently planning a website redesign. The university will continue to use Localist’s API to display relevant events on department, student group and campus web pages. Everyone is extremely happy with Localist. It has facilitated communications and general goodwill between the IT Digital Services Group and other departments. Offering Localist is an easy way for us to bring value to other departments without incurring much overhead. Are you ready to streamline your event management?